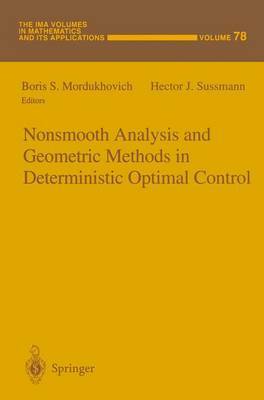 This IMA Volume in Mathematics and its Applications NONSMOOTH ANALYSIS AND GEOMETRIC METHODS IN DETERMINISTIC OPTIMAL CONTROL is based on the proceedings of a workshop that was an integral part of the 1992-93 IMA program on "Control Theory. " The purpose of this workshop was to concentrate on powerful mathematical techniques that have been de- veloped in deterministic optimal control theory after the basic foundations of the theory (existence theorems, maximum principle, dynamic program- ming, sufficiency theorems for sufficiently smooth fields of extremals) were laid out in the 1960s. These advanced techniques make it possible to derive much more detailed information about the structure of solutions than could be obtained in the past, and they support new algorithmic approaches to the calculation of such solutions. We thank Boris S. Mordukhovich and Hector J. Sussmann for organiz- ing the workshop and editing the proceedings. We also take this oppor- tunity to thank the National Science Foundation and the Army Research Office, whose financial support made the workshop possible. A vner Friedman Willard Miller, Jr. v PREFACE This volume contains the proceedings of the workshop on Nonsmooth Analysis and Geometric Methods in Deterministic Optimal Control held at the Institute for Mathematics and its Applications on February 8-17, 1993 during a special year devoted to Control Theory and its Applications. The workshop-whose organizing committee consisted of V. J urdjevic, B. S. Mordukhovich, R. T. Rockafellar, and H. J.